Pittsburgh families deserve delicious food! Who’s hungry? 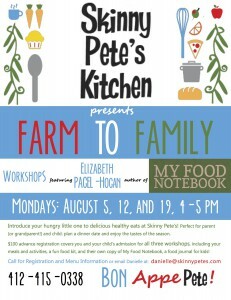 Join me at Skinny Pete’s in Avalon for Farm to Family, a fantastic new option and from one of the truly family friendly restaurants in Pittsburgh. Parents, grandparents and kids can come together to enjoy a special meal in a relaxed fun atmosphere. Kids get to create their own meal while adults can take a breather and enjoy fresh farm-to-table offerings from Skinny Pete’s. Kids also get their own copy of My Food Notebook to record the foods they’ve tried. We need more opportunities for families to enjoy delicious food in a family-friendly setting – and Skinny Pete’s is making it happen. Even if you can’t stay for dinner each meal is available for carry out. Make your reservations today and stay connected with Skinny Pete’s on Facebook.